Accepted Scientific Name: Mammillaria beneckei Ehrenb. Origin and Habitat: Southern Mexico in Michoacan, Nayarit, Sinaloa, Colima, Jalisco, Mexico, Oaxaca, and Guerrero. Mammillaria beneckei is a very widespread species that is very abundant. Altitude range: 0 to 1600 metres above sea level. Habitat and Ecology: Mammillaria beneckei grows in dry deciduous forest interspersed with other succulents and xerophytes comprising Backebergia militaris, Ritterocereus griseus, Rathbunia kerberi, Mammillaria mazatlanensis, Mammillaria occidentalis, Selenicereus murilli, Pachycereus pecten-aboriginum, Stenocereus pruinosus, Stenocereus quevedonis, Stenocereus marginatus, Neodawsonia apicicephala, Pilosocereus alensis, Rathbunia kerberi, Pereskia lychnidiflora, Pereskiopsis digueti, Opuntia decumbens, Opuntia jaliscana, Ipomoea arborescens, Ceiba pentandra, Elaeis oleifera and Rhizophora mangle only to cite a few of the more common. Although there are localized threats in parts of its range the species is common and abundant, only the building of dams in the State of Jalisco is resulting in the drowning of some subpopulations. This species is grown as an ornamental by collectors. Mammillaria barkeri Shurly ex Backeb. 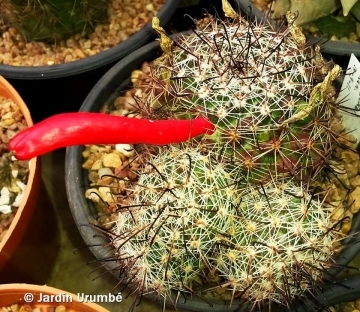 Mammillaria guiengolensis Bravo & T.MacDoug. Mammillaria nelsonii (Britton & Rose) Boed. Dolichothele nelsonii (Britton & Rose) Backeb. Oehmea nelsonii (Britton & Rose) Buxb. 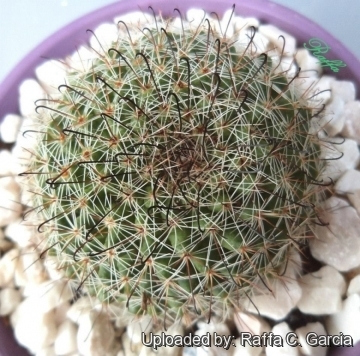 Description: Mammillaria beneckei is a variable species, usually offsetting and not very large. It has white radial spines and brown hooked centrals. Note: Mammillaria beneckei comes from a large area of western Mexico and has carried many superfluous names now reduced to synonyms. Systematically it differs from the rest of Mammillarias and when in bloom all the differences are evident. In fact it presents a floral tube up to 3 cm long and a corolla of bright yellow petals about 3 cm wide, one of the largest of its genus. Besides its seeds are quite large and rough compared to those of other Mammillarias, so much so that it had been erected for it the monotypic genus Oehemea. Habit: Plants solitary at first, later forming large clumps to 50 cm or more wide. Stems: Depressed globose, tending to lengthen with age, green to greenish brown, and often purplish 5-10 cm high and 5-7 cm in diameter. Tubercles: Broadly conical, soft, often becoming reddish or purplish, without latex, axils with little wool and without (or with sparse) bristles. Central spines: 2-6, needle-like, brown or black, 8-12 mm long, 1-2 longer and hooked. Radial spines: 12-15, fine, needle-like, white or yellow, with darker tips, 6-8 mm long. Flowers: Large, but seldom produced, salverform, deep yellow (or occasionally even orange), 20-25(-35) mm long, to 30 (or more) mm in diameter. Stigmas deep yellow to orange. 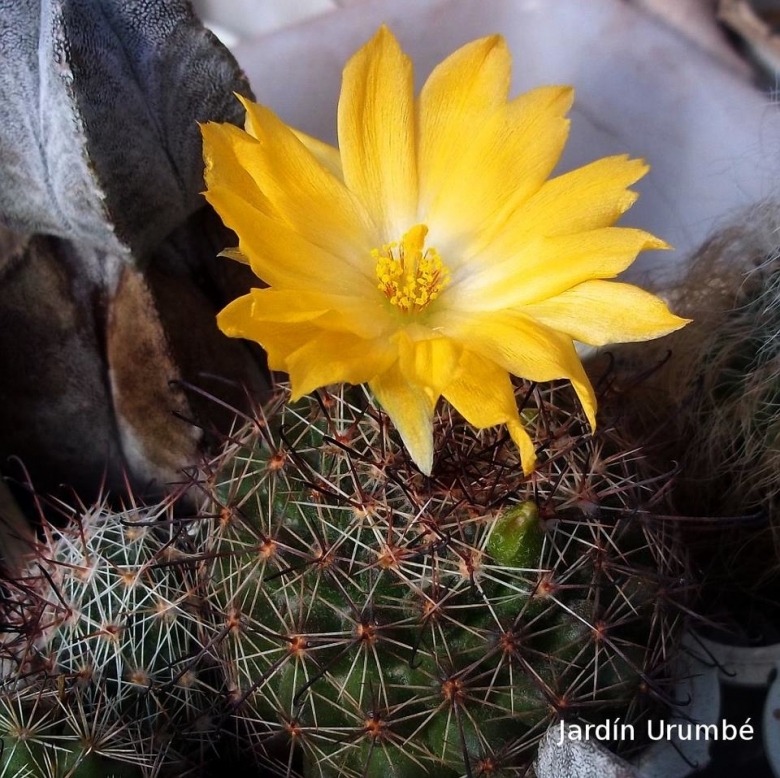 Unlike other Mammillarias, the flower lasts for a short time. The flowers open at night and close permanently around noon, almost like Echinopsis. Fruits; Slender, club shaped at the tip, red. Seeds: Very large, up to 2.5 mm long, dark brown, rough. Mammillaria balsasoides R.T.Craig: same as: Mammillaria beneckei. Distribution: Rio Balsas, Guerrero (Mexico, Northern America). Mammillaria beneckei Ehrenb. : has white radial spines and brown hooked centrals. The flowers are bright yellow about 3 cm wide, one of the largest of its genus. Distribution: Southern Mexico in Michoacan, Nayarit, Sinaloa, Colima, Jalisco, Mexico, Oaxaca, and Guerrero. 1) Arreola, H. & Terrazas, T. 2013. “Mammillaria beneckei”. The IUCN Red List of Threatened Species. Version 2014.3. <www.iucnredlist.org>. Downloaded on 31 January 2015. 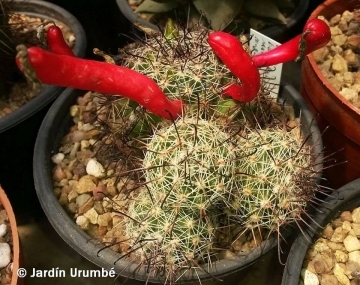 9) Hunt, D. “A new review of Mammillaria names.” British Cactus and Succulent Society. Oxford. 1987. 10) CONABIO. “Catálogo taxonómico de especies de México.” 1. In Capital Nat. México. CONABIO, Mexico City. 2009. 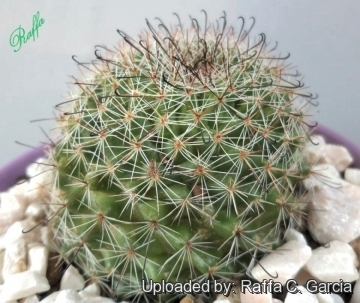 Cultivation and Propagation: Mammillaria beneckei is a great looking cactus that offsets eventually forming wonderful clumps up to 50 cm in diameter, but is very sensitive to low temperatures and needs extra heat in winter. Growth rate: From seed, it will fill a large pot in just a few years. Offsets are produced at the base, and are distributed somewhat randomly. Since the plant can make wide spreading mounds, shallow pots of large diameter will be required as the plant ages. It is not particularly difficult on own roots. No special cultural requirements. Soils: It likes very porous standard neutral cactus mix soil. Watering: It should be watered generously during the growing season, but do not overwater (Rot prone), keep dry in winter. Water it less than average if in bigger pots, small pots preferred. Hardiness: This species is very sensitive to to frost and needs extra heat in winter, but less sensitive if kept on the dry side prior to, and during, cold weather. However warmth throughout the year will increase the grower's success (8-12°C during rest season). Exposition: Outside bright, hot conditions or afternoon shade, inside it needs bright light, and some direct sun. Turns brown or reddish in intense light, which is needed to induce flowering. Strong light encourages heavy wool and spine production. Propagation: Division, direct sow after last frost or (often) graft. Seeds germinate in 7-14 days at 21-27° C in spring, remove the glass cover gradually as the plants develops and keep ventilated, no full sun for young plants! To make a cutting twist off a branch and permit it to dry out a couple of weeks, lay it on the soil and insert the stem end partially into the soil. Try to keep the cutting upright so that the roots are able to grow downward.